The big contenders last year, like Victor “Punk” Woodley, Du “Nuckledu” Dang, and Ryan “FChamp” Ramirez, all got eliminated in this year’s competition pools. 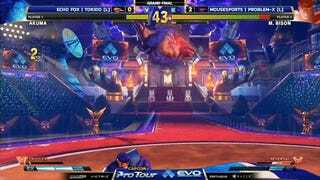 And in the very first match of the finals, Evo 2017 winner Tokido got knocked down to the losers bracket. This Top 8 event was going to throw some curveballs. Two of the promising first-timers did get knocked out of the competition early, including the American favorite Marcus “The Cool Kid93" Redmond, as well as the Dominican Republic’s Cristopher “Caba” Rodriguez. Both had impressive performances in their debuts under the bright lights and loud crowds of the Evo arena, though, with each narrowly losing 2-3 against more experienced opponents that had made it into Evo finals in years past. Here’s the name of the newcomer to the Evo arena stage that everyone will remember after tonight: Benjamin “Problem-X” Simon, a British M. Bison player who competed in Evo last year but got eliminated in qualifying pools. This year, he made it all the way to the grand finals with M. Bison plays that were as cool and calculated as the buttoned-up dictator. Problem-X would watch and wait, sliding out poked attacks and confirming them into deathly scissor-kicks and well-practiced combos. While Problem-X showed off his conditioning in the winners bracket, Tokido battled his way through the entire losers bracket, eventually facing the very fighter who had put him there in the first place: Keita “Fuudo” Ai. Fuudo has placed first in Street Fighter at Evo before, albeit not SFV, but Street Fighter IV: Arcade Edition back in 2011. Throughout his run in losers, though, Tokido kept on smiling, and he was still smiling when he came face to face with Fuudo again. The smile was an ominous change for Tokido, whose nickname “Murderface” refers to his icy focus and meditative precision. As the Street Fighter V finals headed well past 11:30 pm, Tokido kept on grinning, putting on a much more powerful performance against Fuudo in this second go-round. Tokido showed off his versatility with Akuma, tossing out dangerous and unexpected moves yet seeing those risks pay off, while still maintaining his precision by teching throws and nailing his anti-airs. In the end, Tokido cleared his way out of losers and back into the winners finals, seemingly on his way towards a second year of earning the Evo trophy. But Problem-X was waiting for him. In Evo 2018, he was a newcomer in the same position as Victor “Punk” Woodley last year. From the UK instead of America, but still a first-timer to the Evo arena stage, the M. Bison main was not smiling as wide as the experienced Tokido. Unlike Punk last year, though, Problem-X stayed on point. He brought out his same methodical combos, his same scissor-kicks, his same patience. But Tokido’s experience and Akuma’s versatility are nothing to deny, and eventually, the veteran clawed his way back into a bracket reset. It was midnight local time, by now. Tokido’s smile looked much weaker. Problem-X looked tired, sweating, rubbing his hands over the bridge of his nose. But he had more fight left in him. And in the end, he scissor-kicked his way to victory. Problem-X’s win echoes the Tekken 7 results today, in which a younger competitor also beat a veteran, as well as the Melee results, which featured several unexpected competitors in finals and also the toppling of a god. Clearly, anything can happen at Evo.